As the angelic realm is limited neither by space or time, the Archangels can connect with any one of us, whenever me may be in need of their services. 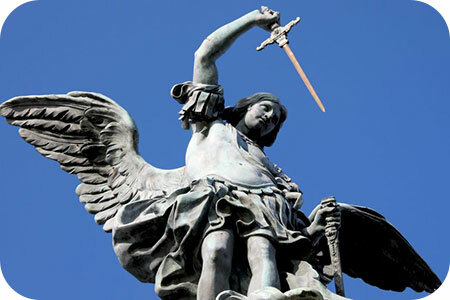 Should doubt, worry and fear plague you, then Archangel Michael can smite with his mighty sword any negative energy attachments that may have linked themselves to you, thus allowing you to remain positive and attract all the abundance the Universe has to offer. There is no right or wrong time to connect with Archangel Michael. Therefore, should you need his assistance to cleanse the atmosphere, either at home or work, or dissolve any negative emotions, he will be on hand to help you. He is also very good at motivating you to make any necessary changes in your life that you may have refrained from doing for too long. Furthermore, nothing is too much to ask of Archangel Michael, so it will never be a waste of your time to request his services whenever you feel the need to do so. He is adept at picking you up if you feel yourself having low energy, or are sad for whatever reason, and he can help you to reset your life compass. With Michael at your side you can get your life going in the right direction and thus live it with more vibrancy and passion! Connecting with Archangel Michael is relatively easy and you do not need to be an expert in the field of spirituality to do so. A simple and effective way of connecting with him is to ensure that your mind is clear to begin with. So, take a few deep breaths, turn your attention within and try to remain as calm as possible. Now visualize the light that Archangel Michael emanates permeating your very being. Next, request that he connects with you in the moment and ask that he confirm his presence. Simply say in your mind, or out loud, “Archangel Michael please assist me today.” Or, ” Archangel Michael kindly connect with me in my hour of need.” However you petition him, provided you speak from the heart, he will undoubtedly hear you and come to your aid. Now tune into your senses and ask him anything you feel the need to ask – he will always answer! Visualizing Archangel Michael can also really help you with this communication process. Imagine this fabulous being in his splendid armor and beautiful blue cape to your left, then to your right, behind you and in front of you. After that you need to visualize him beneath you, within you and above you. See him with his fellow Archangels, nurturing, supporting and guiding you throughout your lifetime. Once you have fully made contact with Archangel Michael, it is imperative you put to him, in detail, all that what you need help with. However, this help may not present itself as some form of divine intervention, but instead be more subtle such as a thought that will not leave your mind, a crossing of paths with a particular individual, or simply a ‘knowing’ as to how to move forward. It is true that the angelic realm is both lighter and finer than the physical reality in which we live. Nevertheless, with sufficient time, effort and dedication you should be able to link with it and having done so, be able to see, hear, sense and feel the very presence of all of the Archangels, including Michael himself. Some people prefer to pray while visualizing, or afterwards. Whatever works for you is best. Here then is a simple prayer for your consideration. Archangel Michael, kindly bless me and protect me with your guiding light throughout the day and remain with me during my sleeping hours. Assist me in the releasing of all negative thoughts and beliefs so that I can live my life to the fullest capacity. Please help me to experience all the joy, love and light in the world at all times. Amen. While this prayer may be considered to be quite general, you can always choose your own words and desires in accordance with your needs. It honestly doesn’t matter whether you have a lengthy or short prayer to put to Archangel Michael. What is more important is consistency and faith that he will help you to fully connect with him on a regular basis. It is also an excellent idea to making praying a daily habit. You could even create your own morning prayer for protection, for yourself and your loved ones, in the morning, as well as a message of gratitude in the evening, for Archangel Michael having watched over you. Again, provided you speak from the heart that is all that matters.